Sure, I'll share that but you will be disappointed. First a little background, I don't want my bots to stop, just ride the market. I selected the pair and tuned the statistics interval to the point I am confident I will not loose my shirt too fast. Mine run on a remote server in another country 24/7 up to 5 weeks at a time non-stop. 99% of the time these days the only thing I do is to restart a stopped bot because the API signal came through slow or scrambled and the bot stops to avoid a double buy. My Bollinger Band bots are on Binance are currently just cycling but not trading. I pulled out of Binance for a time until things settle down, up until two days ago this was my main interest. I do very little babysitting or nannying of my mArgin maker bots relatively, hence my settings (all pair use the same settings except for the interval). Your setting for min effective gain is -50 and no setting for stop-loss means the bot will only sell when price drop half (50%)?? Can help explain a bit on Bollinger Bands? I can not understand how the strategy work (I only use first margin strategy), thanks! 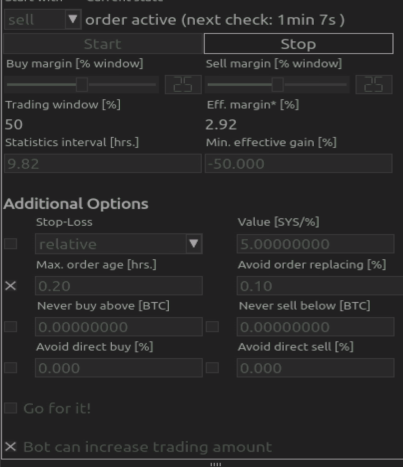 Re: [ANN] leonArdo - Trading GUI/Bot for Bittrex, Poloniex, ... New Dark Skin!! Unfortunately This Bot wasn't up-to the level that I was hoping for- While it's Graphical interface "nice" - the trading Strategies available are very limited. However I have tried other bots, that have Less Graphical Niceness and more Strategies - It seems that no one can come up with a Bot that is Both.. Considering that bots cost $120-$500 - that's alot of money for not much in return. What will the Subscription model bring? - What New Features will it Incorporate? The bots these days seem like they are in Alpha/Beta Stages then Full Release. I must give Credit to Leonardo Bot as it is the best looking bot I've seen And it has had a 1 time Payment in USD! (unlike BTC payment only cr@p - that the other bots require). In my Humble Opinion - Bots that use "Emotional Trading" or Insider/Secret Knowledge trading - Other connected to Telegram and other "sources" can be highly Manipulated. Don't Trade On Emotions! Trade On Price and Indicators Only. We want to stay away from raising money with an ICO because of the legal uncertainty around it. I had felt the volumes had been getting very mushy since the middle of January, turns out there may be some math behind it indicating that more than a few exchanges have been playing with the numbers. So if you are seeing double and triple buys/sells where you think the volume should handle it (except spot buy/sells), maybe you are on a exchange that is "adjusting" their volume amounts. In my opinion, I believe there is validity in the article but it does come off as a low ball pro-Binance ad. Another thing is it casts Poloniex which is currently problematic in itself and Bittrex (who has slid 6 positions in the last week) in the same light. "The study also looked at exchanges like Bittrex, Hitbtc, and Binance against “respectable” exchanges." -Without explanation or back story, which comes off as a paid-for op-ed by zc. At any rate I am glad someone is looking at the numbers, hopefully someone else will come a long and "fact check" them. I had a feeling..
And don't give a f#$% about the moral and ethical 'un'certainty. Really liking the design. One suggestion, regarding Multichart view, and multiple monitors. May help if have the coin pairs in large letters, so can easily distinguish from one chart to the next. Maybe top left of the chart in large letters. Indicators on Multicharts would also be a benefit. Also, if where easy enough to implement, to be able to expand the current number of charts restriction (50? ), would be nice, as many traders have a few monitors capable of displaying more. Any indication as to new pricing and structure? Really liking the the design. One suggestion, regarding Multichart view, and multiple monitors. May help if have the coin pairs in large letters, so can easily distinguish from one chart to the next. Maybe top left of the chart in large letters. Thank you. If I where to be critical of the pricing structure and current market, (ie, many more coming into market, with AI etc...), Would it not be better to focus on 'features', and not 'monetary balance'? As, may I suggest, anyone with $100000+, may consider other platforms, AI etc..? Allow someone to purchase your product, fully working, at a good market, fixed price, with limitations. When happy with product, wishes to pay to unlock additional features to benefit from. Thus, creates a large userbase, and the maintaining of. A one-off payment for a limited product, with full unlock potential. This a very competitive market now, and to only allow initial access with a monthly payment, may cloud company in the crowd IMO. Do you think add to new Exchanges? Like Livecoin, cryptopia etc. We will also add more exchanges in the future based on trading volumes and demand. thank you, I am looking to forward from hearing you. Yes, this is something on our radar to implement. Thanks for the suggestion.